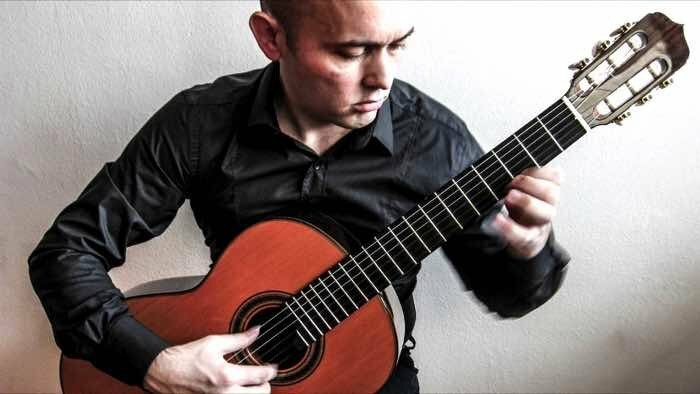 Maroje Brčić is a Croatian guitarist who works as a professor at the Academy of Arts in Split and Dubrovnik. At this picture he is teaching Andrija Lazarevic, winner of the first prize in category IV of the competition of the Sarajevo International Guitar Festival. Category IV is for competitors born in or after 1994. The first prize included a D’Addario gift box, the participation fee for the next festival and a guitar. This are Michael and Miyuki Richards, enjoying their holidays in Amsterdam. A couple of weeks ago Michael bought a guitar at the Guitar Salon and now, walking through our beautiful city, he decided to check out it’s maker.